As the release of Ender’s Game occurred this past Friday at my favorite movie theatre, I rushed to see it. Ironically enough, I had seen someone, right before Christmas break, check this out at our school library and realized this is something I was not familiar with. I am eager to check out the book after having viewed the movie, I knew no plot going in but that did not ruin anything for me. The characters surprised me. Harrison Ford was great in a role dominated by younger characters, and usually playing the good guy all the time, managed to slip into good guy / bad guy quite often and doing well. The character that played Ender and Petra I thought did especially well, and it was actually nice to see some Spanish being peppered in the character of Bonzo. The biggest walkaway? When I first went to see this, from the previews I could only think of the film The Last Starfighter that I had seen in the theatre as well I was enthralled that a video game was coyly used as a recruiting tool, and I fell into the plot quite easily with a memorable fondness for this film back in the 80’s. What used to be the us versus them in films when it came to other countries has certainly changed. War Games, Red Dawn and so many films fueled that anxiety. Ender’s Game refreshingly proves that as the fear of what happens when imperialism and tapping out resources for one culture and one culture only occurs, then the ruination of the individual occurs. For once the concern for other countries, species, and communication instead of always justifying dominance and fighting begins to eek out of the screen. If that can spill over into real life, then things will begin to change as they do on the screen for Ender Wiggin. A good movie worth seeing, as I felt there was many interesting strands of plot that were supported. I just am anxious to see how it compares with Orson Scott Card’s book. Great find, GREAT. 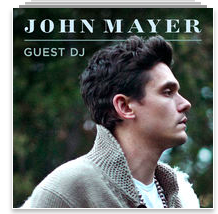 Itunes, online radio, John Mayer as guest DJ. You need to check out his tips for the best songs he would recommend. AMAZING collection of hits that I amazingly listened to like six times and still did not get tired of them. GREAT find. This entry was posted in Uncategorized and tagged Ender's Game, John Mayer, Orson Scott Card, Red Dawn, The Last Starfighter, War Games. Bookmark the permalink.